An earworm is a tune that is so engaging, that it keeps going around your head. You can’t shake it loose, even when you want to. 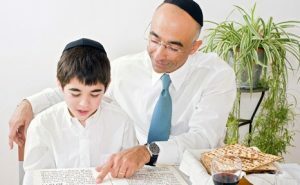 If there is an analogue concerning the seder in the non-musical arena, Rav Aaron Lopiansky, the rosh yeshiva of the Yeshiva of Greater Washington, wrote it. Rav Lopiansky has justly earned himself recognition as one of the most important thinkers in the Torah world today. His mechutan took a piece from his book Time Pieces, and asked that it be disseminated. If you read one item to put yourself in the mood for the seder this Pesach, this should be it. And it should continue to ring in your ears through the seder, and well beyond. My dear child, It is now a quiet moment late at night. After an exhausting day of Passover cleaning, you have sunk into the sweetest of sleeps, and I am sitting here with a pile of haggadas, preparing for Seder night. Somehow the words never come out the way I want them to, and the Seder evening is always unpredictable. But so many thoughts and feelings are welling up in my mind and I want to share them with you. These are the words I mean to say at the Seder. When you will see me at the Seder dressed in Kittell, the same plain white garment worn on Yom Kippur, your first question will be, “Why are you dressed like this?” Because it is Yom Kippur, a day of reckoning. You see, each one of us has a double role. First and foremost we are human beings, creatures in the image of God, and on Yom Kippur, we are examined if indeed we are worthy of that title. But we are also components of Klal Yisrael, the Jewish People, links in a chain that started over 3,000 years ago and will make it to the finish line of the end of times. It is a relay race where a torch is passed on through all the ages, and it is our charge, to take it from the one before and pass it on to the one after. Tonight we are being judged as to how well we have received our tradition and how well we are passing it on“It is now 3,300 years since we received that freedom in Egypt. If we imagine the average age of having a child to be about 25 years of age, there are four generations each century. That means there is a total of 132 people stretching from our forefathers in Egypt to us today. 132 people had to pass on this heritage flawlessly, with a devotion and single-mindedness that could not falter. 132 fathers, each with his own story. Each with his own test of faith. And each with one overriding and burning desire: that this legacy be passed unscathed to me. And one request of me: that I pass this on to you, my sweet child. What is this treasure that they have given their lives for? What is in this precious packet that 132 generations have given up everything for? It is a great secret: That man is capable of being a lot more than an intelligent primate. That the truth of an Almighty God does not depend on public approval, and no matter how many people jeer at you, truth never changes. That the quality of life is not measured by goods but by the good. That one can be powerfully hungry, and yet one can forgo eating if it is not kosher. That a penny that is not mine is not mine, no matter the temptation or rationalization. That family bonding is a lot more than birthday parties; it is a commitment of loyalty that does not buckle in a moment of craving or lust. And so much more. This is our precious secret, and it is our charge to live it and to become a shining display of “This is what it means to live with God.” 132 people have sat Seder night after Seder night, year after year, and with every fiber of their heart and soul have made sure that this treasure would become mine and yours. Doubters have risen who are busy sifting the sands of the Sinai trying to find some dried out bones as residues of my great-great-grandfather. They are looking in the wrong place. The residue is in the soul of every one of these 132 grandfathers whose entirety of life was wrapped up in the preservation of this memory and treasure. It is unthinkable that a message borne with such fervor and intensity, against such challenges and odds, is the result of a vague legend or the fantasy of an idle mind. I am the 133rd person in this holy chain. At times I doubt if I am passing it on well enough. I try hard, but it is hard not to quiver when you are on the vertical shoulders of 132 people, begging you not to disappoint them by toppling everyone with you swaying in the wind. My dear child, may God grant us many long and happy years together. But one day, in the distant future, I’ll be dressed in a kittel again as they prepare me for my burial. Try to remember that this is the treasure that I have passed on to you. And then it will be your turn, you will be the 134th with the sacred duty to pass on our legacy to number 135. I think of spiders. They work hard and methodically to build their webs, and then along comes somebody to wipe it all away within moments. So what does the spider do? It certainly does not sit there feeling sorry for itself. It picks up right where it left off, rebuilding its webs all over again. When more than six million of our fellow Jews were so brutally murdered for the crime of being Jewish, Jews did not whine. Yes, we want the world to know about the Holocaust so that it never happens again, but fundamentally, Jews did not sit around moping, feeling sorry themselves, claiming victimhood, or demanding more and more government handouts. Rather, we built and built, and within three years of the defeat of the nazis, we had our own Jewish State back under our control. And even in Israel, when they experience the most cruel acts of terrorism from those savages who worship Allah, Jews rebuild the location where the terrorism occurred, as if nothing happened, both to deter future terrorism, and also as a statement to the world that nobody can stop us from our constant efforts to make this world a more civilized place. And yet the world hates us for it. In fact, when I read the long quotation in the above article, it struck me as being a metaphor for the battle between good and evil, between the better angels of our nature, and our darkside. Our raw physicality wants to let completely loose in expressing its primitive desires, much as the nazis sought to rid our world of moral conscience, yet along comes our spiritual side and instead of destroying that force that hates us so much, we recognize its value and seek to elevate it, to spiritualize the physical, so that the physical, too, is inundated with G-dliness, and thus there is no place where He is not. We will always win, because G-d always wins. Many of us have met people who saw the Chofetz Chaim, who saw Rav Yisroel Salanter, who saw people that saw The Gaon. Many of us have met people who saw the children of the Tzanzer Rov, who saw talmidim of the Baal Shem Tov. Previous story Who Deserves to be Our Hero?